In a large, nonstick skillet, add enough oil to cover 1/4 inch up the bottom of the pan. Heat over medium heat; when oil is hot, add half of the cubes and pan fry until one side is golden brown, flip and pan fry the other side until golden brown, approximately, 1-2 minutes per side, watching closely so they don’t burn. When browned, immediately add cubes to the cinnamon/sugar bowl and toss using a spatula (because they are hot! 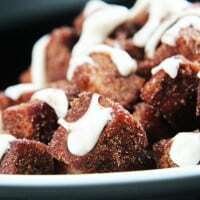 ), pressing sugar/cinnamon into the cubes until well coated. Repeat for remaining angel food cake bites.